As the latest entry in Marvel’s cinematic landscape, expectations were high for Guardians of the Galaxy, though truth be told, very few people were actually familiar with the source material. Chalk it up to another win for the studio’s marketing team, which has so far brought formerly B-list superheroes such as Thor, Captain America, and Iron Man to the forefront of box office revenue rankings. In any case, Guardians offers familiar thrills, charming characters, and dozens of easter eggs that will leave you glued to your seat whether you are a Comic-con junkie or couldn’t tell Kryptonite from Samsonite. Let’s start with what could be improved. The villains of Guardians, Ronan and Nebula, are not particularly engaging. We only see them sprinkled a few times throughout the movie, and their motivations are vague, at best. Something about Kree revenge and a peace treaty is mentioned, though never really explained in any sort of satisfactory detail. The appearance of Thanos (while sure to cause giddiness in the Marvel fanatic) is similarly tantalizing, though I suspect the studio is anticipating fleshing out his story further in future movies. 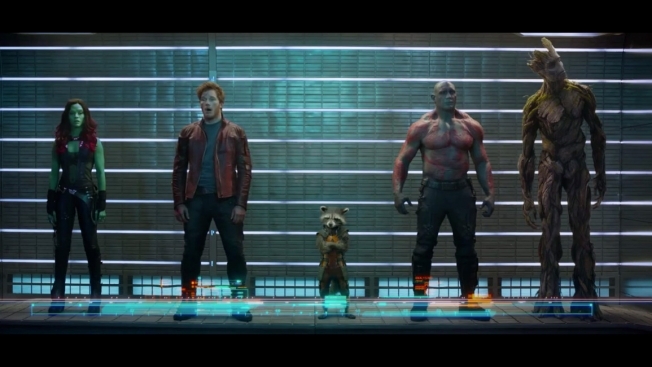 The story is also one we’ve all heard before – bucking young hero with something to prove (Peter Quill/Starlord) finds immeasurably powerful object (Infinity Stone), bad guys (Ronan & Nebula) want this object to destroy the universe, hero teams up with spunky sidekicks (Rocket, Groot, Drax, Gamora) to defeat the bad guys. In fact, this seems to be a recurring trend in Marvel movies specifically (cf. Thor, Iron Man). However, this may actually work to the film’s favor, as an audience already intimate with the plot is free to focus on the aspect of this movie that really shines – the characters. Chris Pratt truly brings his A-game to this movie in a way we’ve never seen him before. As a fan of his other most famous role in TV’s Parks and Recreation, it brought me great joy to see Bert Macklin, FBI, finally getting his chance to shine. With his newly sculpted body, heavy action scenes, and stellar performance, it’s safe to say that Pratt has achieved Hollywood leading-man status. Pratt’s guy-next-door attitude and gutter humor also play off of Bradley Cooper’s sarcastic talking raccoon Rocket to great effect. When this movie was originally announced, I was highly skeptical of talking animals and trees, but Cooper as Rocket and Vin Diesel as Groot provide the standout comedy in this film. With just his one line of “I am Groot.” delivered in numerous inflections, Diesel has audiences rolling in their seats with laughter time and time again. Rounding off the crew are Zoe Saldana as Gamora, the adopted daughter of Thanos out for revenge, and the muscular Dave Bautista as Drax, a prisoner whose family was killed by Thanos. Guardians of the Galaxy, with its throwback 70s/80s music, dazzling battle scenes, and amusing cast of characters, is guaranteed to keep you entertained for its 2-hour run time. And you probably don’t need to be reminded by now, but don’t forget to stick around for the after-credits scene!